Paradigm Initiative has unveiled its “Digital Rights and Inclusion Media Fellowship“, a new programme dedicated to improving media coverage of digital rights & inclusion issues. 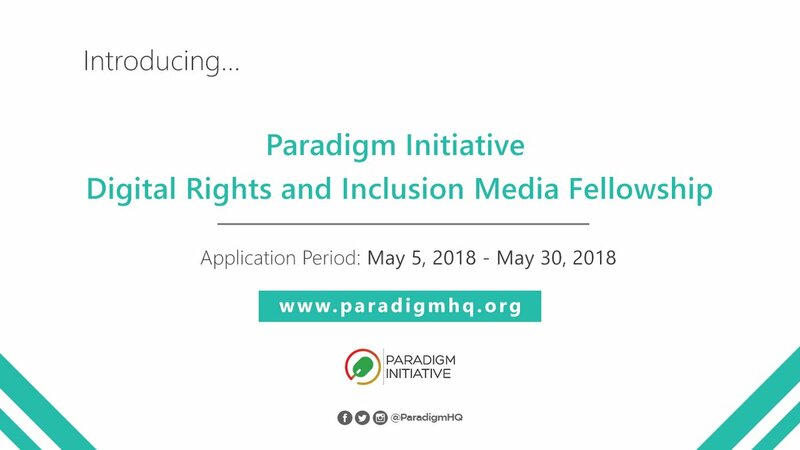 The Paradigm Initiative Digital Rights and Digital Inclusion Media Fellowship seeks to embed media professionals within the daily work of Paradigm Initiative in the fields of digital rights and digital inclusion in Africa. Fellowship will run from August to December 2018. The Fellowship is a 5-month program designed to immerse outstanding, early career, journalists in digital rights and digital inclusion advocacy – and intervention efforts – in Africa. Selected journalists will work with Paradigm Initiative on various projects and contribute to improving public understanding of digital rights and inclusion issues. Starting from August 2018, Media Fellows will work out of their offices in Yaba, Ajegunle Lagos; Aba, Abuja and Kano in Nigeria. Applications is open to Journalists working in Africa. This fellowship seeks to expose media professionals to an under-reported field of work in national development and hopes to increase reporting on digital rights and inclusion in Nigeria and beyond. Paradigm Initiative will provide fellows with a monthly stipend, and a one-time research grant, during the fellowship period. For more information, visit Paradigm Initiative.